Disclaimer: I received the #DisneyKids Preschool Playdate Kit for no cost for the purposes of review and party planning. All opinions are very much my own. In celebration of our #DisneyKids Preschool Playdate held on Easter Sunday, I wanted to jazz things up and really get ready for Spring! 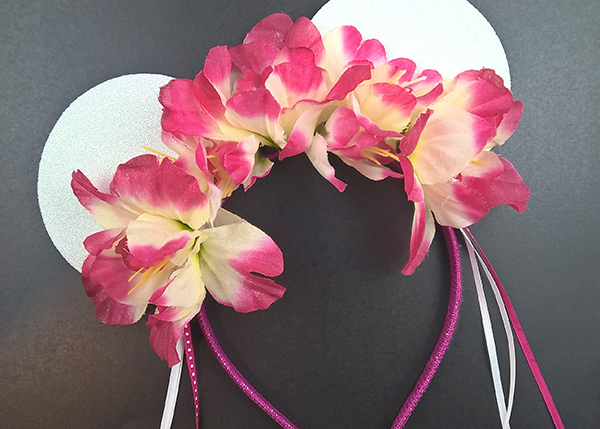 So, I created these floral Minnie-Inspired ears! 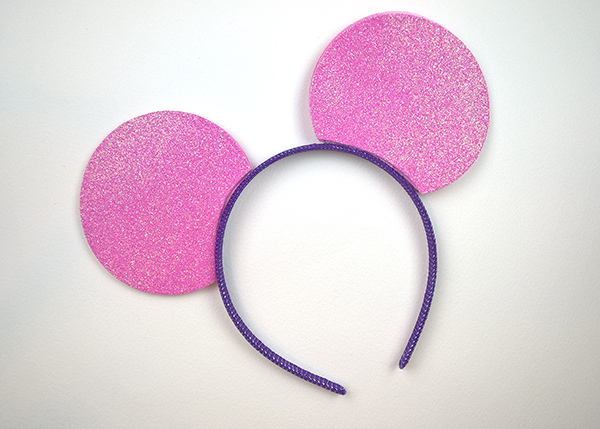 First, create the basic Mickey ears from this previous post. Next, you’ll need silk flowers. 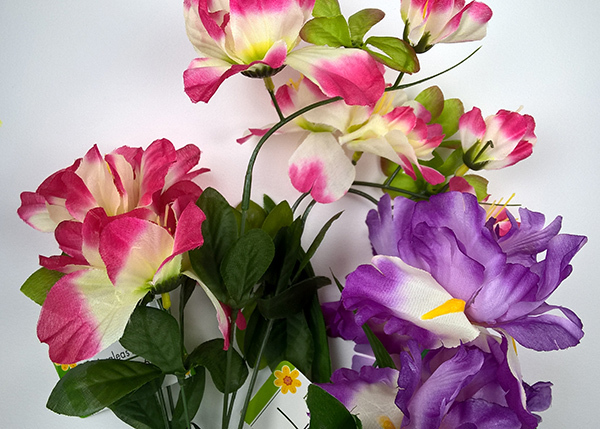 I purchased a few bunches from the dollar store. 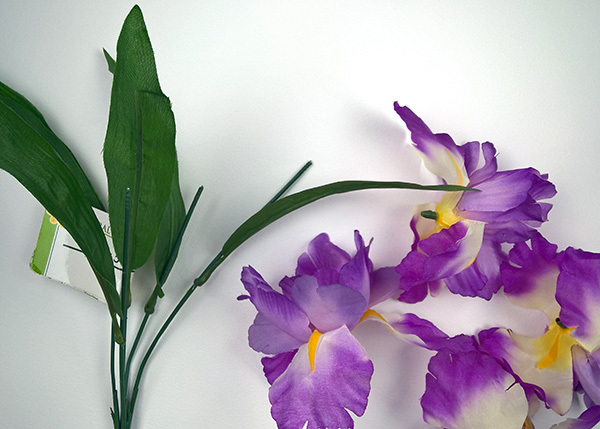 Pluck the flowers from the stems and set aside. I actually used an old chafing dish to limit over spraying, and made sure all the flowers were coated by spinning them around with a stick. It may take a few coats to get the desired look. Let dry completely. Cut ribbon into 8″ lengths. Each spool of ribbon used here cost $.50 at Michaels. 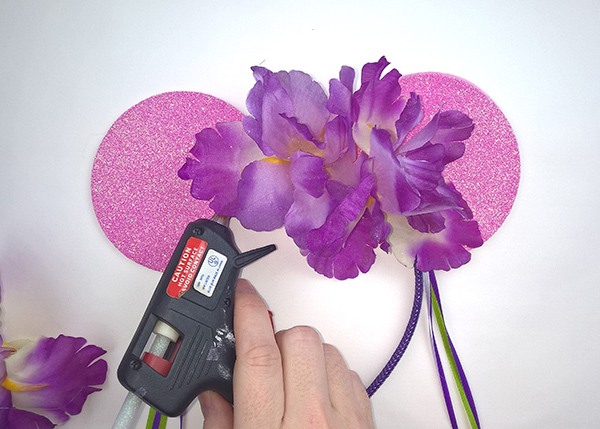 Then add a dab of hot glue to set the ribbon. Repeat, and glue the ribbon on the other side. I used a hot glue stick with iridescent glitter embedded into it. 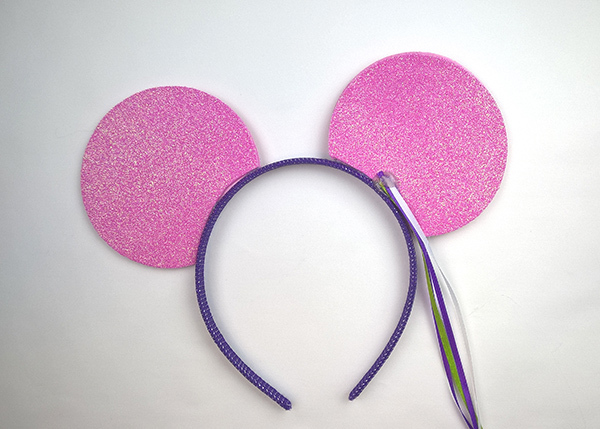 It worked great on these pink Minnie ears, but the iridescent glitter did stick out like a sore thumb against black Mickey ears. 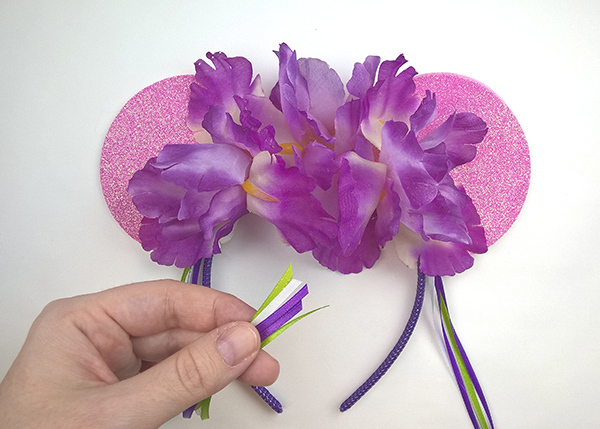 Start to glue the silk flowers to the headband. 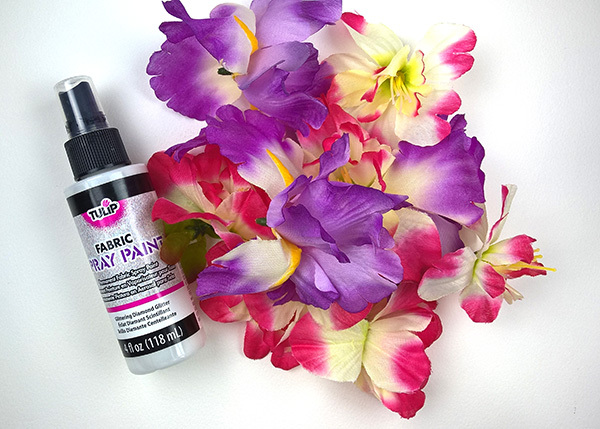 The purple flowers that I chose had an ugly green grommet in the center of them. 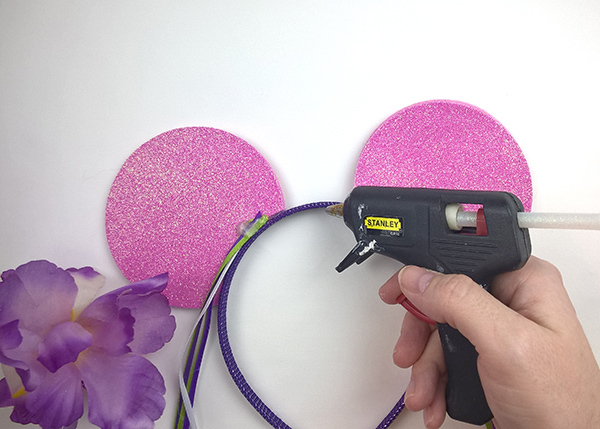 I added a dab of iridescent hot glue, and this nicely covered the grommet. 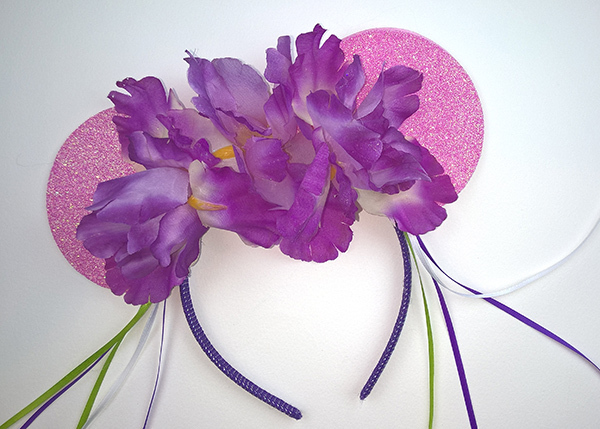 This headband took 3 large silk flowers, but you might need more or less depending on the individual bloom. After you’re done glueing, trim the ribbons. Make sure you cut the ends on a diagonal, this gives them a more polished look. 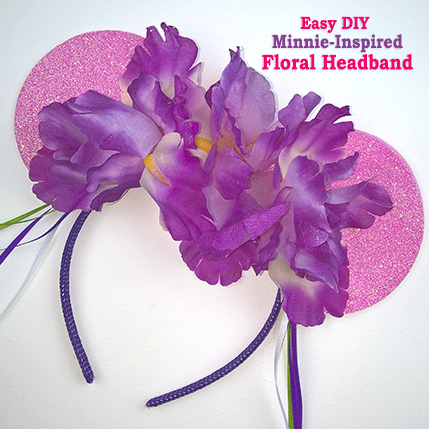 Go crazy and create these headbands however you like! It was a lot of fun, and really easy to make! Stay tuned for more from our #DisneyKids Preschool Playdate!